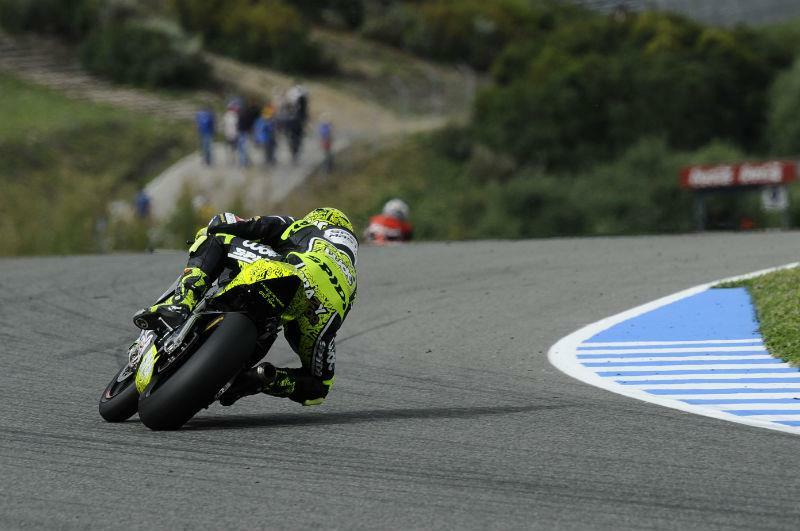 Italian Andrea Iannone charged from the fourth row of the grid to take a dominant victory in a wet Moto2 race at Jerez. Brit Bradley Smith led the race before Simone Corsi overtook him on lap three, coming from 18th on the grid. But then it was the turn of eventual second place finisher Thomas Luthi to take the lead for a few laps before Iannone made his charge for the front. Corsi eventually finished third. Smith held off Qatar race winner Stefan Bradl in the latter stages of the race to finish fourth in only his second Moto2 race. A tremendous result for the Oxfordshire rider. Fellow Brit Coghlan also had a good race, finishing eighth. Unfortunately the same couldn't be said for Scott Redding who struggled onboard his Suter machine and could only manage 23rd place. Alex de Angelis would most likely have been on the podium, were it not for a jump start and ride through penalty. De Angelis finished seventh despite rejoining the race after his penalty lower than 30th place. 125GP champion Marc Marquez failed to finish yet again after he was taken out by Jules Cluzel on lap 16. Julian Simon rode a blistering race today, finishing an epic 27 seconds ahead of his nearest rival.